Oscar Edelstein is considered crucial in the map of Latin American contemporary music, new opera and performance. Always pushing the lines between the classical, the contemporary and the popular, his music has been described as the first time that Latin America has led the avant-garde, and at the sametime is noted for it’s accessibility. His career is has been continually distinguished for breaking new ground, and having been awarded important prizes throughout, in 2011 he was honoured with the highly prestigious award from the National Arts Foundation of Argentina for out-standing artistic achievement, and was made Citizen Illustrious of his hometown. Born in La Paz, in the province of Entre Ríos in Argentina, he studied piano from a young age, until moving to Buenos Aires were his formation as a composer was led by relevant Argentinean teachers such as José Maranzano, Mariano Etkin and Francisco Kröpfl - all of whom were in the line of Juan Carlos Paz who was the composer renowned for first bringing the techniques of the Second Vienna School to Argentina. 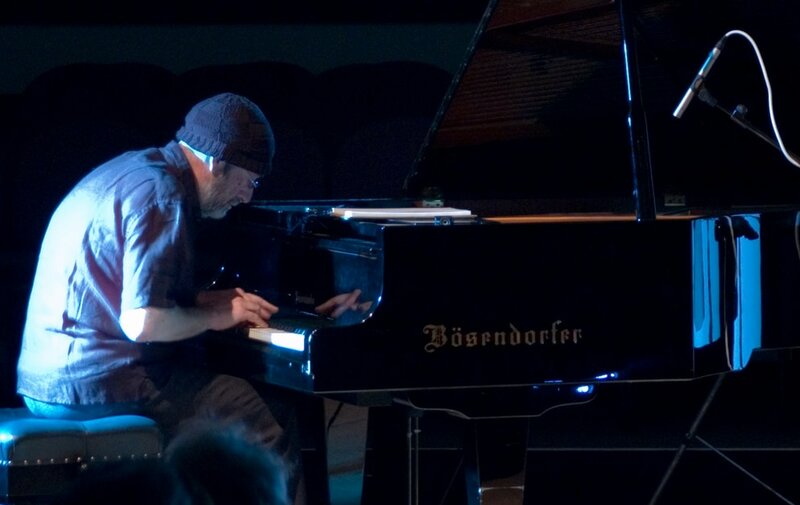 In his compositions Edelstein frequently explores the interplay between music and theatre, where voice and speech interplay with music and technology. He has a close connection to theatre and dance having made music for the theatre of Argentina’s most important directors such as​ Roberto Villanueva, including productions of Tabori’s “Las Variaciones Golberg” (2003), Albee’s “El Juego del Bebé ” (2001), Estrázulas’s “Borges and Perón” (1998), Handke’s “Las personas no razonables están en vías de extinción” (1997), and many others. Edelstein is also known for his many operatic works; "La Carta Imaginaria" (2014), “El Caballo Fantasma” (2011), “Eterna Flotación: los monstruito’” (commissioned by CETC Centro de Experimentación del Teatro Colón - 2006), “La Teoría Sagrada del Espacio Acústico” (2000–2001), “El Tiempo, La Condena” (1999), “El Hecho” (1998), and “Klange, Klange, Urutau” (1997) amongst others. ​The works were commissioned by Teatro Colón and Ministerio de Cultura de la Nación for the Ciclo Iberoamericano de Ópera Contemporánea at the Centro Nacional de la Música. Throughout his career Edelstein has repeatedly shown a commitment to the avant-garde. He was a co-founder of "Lulú" - which published between 1991 and 1992 and named in homage to the Alban Berg's opera and was the first specialist music magazine to speak about contemporary music theories and techniques. It made a unique contribution to the theoretical diffusion of the contemporary arts in Argentina during the 1990’s. As well as consistent search for originality and the avant-garde, Edelstein frequently crosses the lines between the contemporary, the classical and the popular. Equally he is known for playing with the lines between traditional notation and graphic scores, alongside his own 3D scores in a drive to advance the art and practice of music. As a senior professor Edelstein is often asked to lead masterclasses and postgraduate studies based on his own works, theories and composition techniques in many of the most prestigious Latin American and European institutions, including; Manhattan School of Music, and Columbia University (USA); Royal College of Music, Guildhall School of Music (London), University of Central England (Birmingham), Royal Northern College of Music & Drama (Manchester), University of Wales (Aberystwyth), University of Music and Performing Arts (Vienna), and so on. In the last few years he has returned to writing orchestral works and has received commissions from Orquesta Sinfónica Nacional de Argentina, Basel Sinfonietta and London Philharmonic Orchestra, amongst others. Part of a map of the composition for the opera "A Horse Bleeding Shakespeare" chosen my Malta International Festival for an exhibition. In 1997, Edelstein created his own ensemble, the Ensamble Nacional del Sur, in order to test out his own theories and methods of composition. He directs the ENS with a system of traditional notation combined with a new 3-dimensional models that he created. This enables him to conduct the ensemble with a specially developed system of hand signals that allow him not only designate time and intensity but also timbrical and spatial options. He sees the group as a new musical instrument which has developed its particular use of sound colour, and so whilst the format is closer to that of a rock group than that of a classical contemporary ensemble, the sound is very different. ​Each of the members of the ENS are composers as well as musicians and thus can respond with high precision to Edelstein's directions. They train intensively so as to play without scores and as if the music is written in their own bodies. They have taken part in various of Edelstein's operas. The current group is the third generation: Axel Lastra (Piano & Keyboards), Leonardo Salzano (Electric Guitar), Pablo Torterolo (Drums), Alfonso Ollúa (Electric Bass) and Mauro Zannoli (Keyboards & Electronic Processes). The group is often joined by guest artists: Deborah Claire Procter (Voice) and Martin Proscia (Saxophone). Free ranging comparisons have been made from free jazz, King Crimson, Hermeto Pascual, Cecil Taylor and Frank Zappa; to Edgar Varese, the Quinteto of Piazzolla and many others, however the uniqueness of the ENS is that their music is outside any pre-defined genres, what is more they need to be experienced live, where their use of quadraphony gives an added dimension to their music.